The word bicycle does not appear in the title of House Bill 44, but the bill stands to have a major impact on those who like to bike for pleasure or as an alternative form of transportation. Buried in the Local Government Regulatory Reform Act is a provision that stands to restrict the advancement of bicycle lanes across North Carolina. Got that? 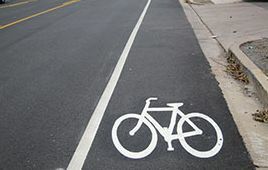 Local official could not add bike lanes to a city until a majority of the NC Board of Transportation offers its blessing. Each year 960 bicyclists are hit by vehicles in North Carolina, making North Carolina one of the least safe states in the US for bicycling. On average, about 160 pedestrians and 20 bicyclists are killed each year in the State, representing about 12% of all traffic fatalities that occur on North Carolina roads. Section 7 of HB44 is counterproductive to NCDOT’s measures to improve public safety on our roads and NCDOT’s Complete Street Policy. The state Senate could give the bill final approval later today. 960, yeesh, that is far too many! Sadly, Durham now has four deaths since last fall. This bill is awful for anyone riding a bicycle in NC.